As morning commuters head down Atlantic Avenue to their jobs in the Financial District today, theyâ€™ll be hard-pressed not to notice whatâ€™s going on at the Summer Street intersection, kitty-corner from South Station. A tent city popped up in Dewey Square over the weekend, and its residents are making their voices heard -- theyâ€™re ready to stay until someone listens. Occupy Boston, one of overÂ 100 occupations that emulates and stands in solidarity withÂ Occupy Wall Street,Â settled into the square at 6 p.m. on Friday night. By Sunday morning, less than 48 hours after the occupation began, the little area beneath the towering buildings had become a smoothly running, although slightly muddy, city-within-a-city: About 50 camping tents of varying sizes, some featuring flags and signs, populated the grass (or what was left of it; organizers have promised to reseed the area in the spring). Larger pop-up tents and tarps held up with poles and rope marked spots for food, first aid, meditation, media, and sign-making, among other facilities. A cardboard path wound through the site, from the welcoming/info table at the back to the spot at the front designated for twice-daily assemblies. Makeshift cigarette disposals lined the area, and garbage sat near the proper receptacles, ready for daily pickup by city sanitation workers. The spectacle elicited honks from passing cars, and passers-by occasionally stopped to watch. Some, like aÂ well-dressed older couple, listened to announcements and seemed eager to help. Although the crowd was sparse around 11 a.m., Cahill estimated that about 1,000 people showed up for Friday nightâ€™s assembly and between 400 and 600 people were milling around on Sunday night. â€œIt comes and goes with the time of day and weather,â€� he said. As a whole, the group is tech-savvy, disseminating much of their information throughÂ Twitter andÂ their website and using those avenues to quietly garner support, whether through aÂ news story, a plethora of donations, or a simple email, Facebook post, or tweet of solidarity. â€œDonations have been great,â€� said Cahill, â€œbut we need bodies.â€� He said that not everyone who came out was camping or staying long-term and urged Bostonians to come check out the scene, even just for an hour or two, and learn a little more. 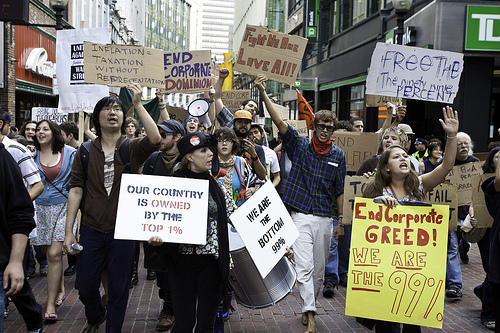 Occupy Boston has been peaceful compared to its Wall Street counterpart. 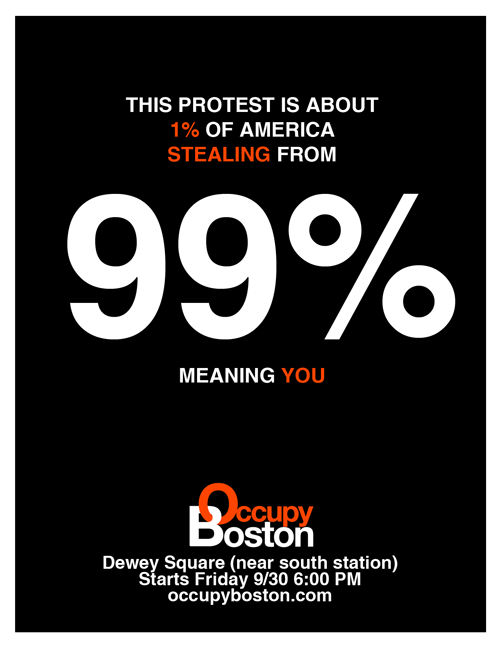 While the New York occupation has earned its media attention viaÂ arrests and allegations ofÂ police brutality, Occupy Boston has been relatively uneventful. The Boston Police Department has officers stationed nearby 24/7 to make sure both the occupiers and passers-by remain safe. They served as crossing guards during a march on Saturday. Want more TNGG? Send us an email. Go to our main site. Follow us on Twitter @nextgreatgen. Like us on Facebook. And subscribe to our newsletter! Need a bike fixed? These geeks get it. Read more from TNGG at TNGG.co.